Thank you Ameena, for the Brotherhood of the World Blogger Award. It was really nice of you to nominate and present a wonderful set of questions. You must check out her blog Randoms by a Random for mind treating posts! 1) Thank and link back to the person who nominated you for the award. 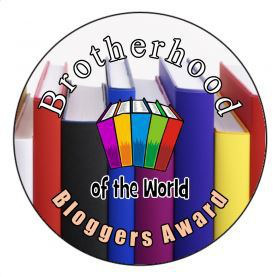 2) List the Rules and Display the Brotherhood of the world Award logo to your post and/or blog. 3) Answer the questions set to you and then you may create your set of questions for your nominees. 2) Why do you blog? Life looks more interesting this way. 4) If you had to choose one- fiction, non-fiction, poetry, which would you choose and why? Poetry. Poetry can be fiction or non fiction! Like for every one else, Like my mother, wife and sister! 6) Life is- a roller coaster, mountain climb, landslide, other. Life is other. Life is the way we see it and make it. Seriously, not yet anyone to mention! Have many likes. No Favorite yet. 8) What legacy would you like to leave. With some master piece drafts of writings! Which one suits you best? Yo! or Yo Yo!! ? Are you a yayy person or whatever person? What is your idea of a flop movie? Sunny evening, five best friends and what? “Game of Thrones”. Yes or No? You and your only best friend. Walk or movie or other? How good chef are you? Short and crisp or long and descriptive? Good answers but 3rd & 6th one are best ! Very natural answers to those set of questions….!! I like the way in which you define the life. Life is what you think of it. very true! You can answer your favorite book but favorite author is always tough to answer. I was reading comments here and I agree blogging is addiction but a positive one!! Hahaha, so first i’m going to comment on your questions because they are AWESOME 😄. Didn’t know there was a difference between yo n yoyo :D.
I love your answers, simple and straight to the point and you know, poetry for me too 😁. Thanks for participating. yo yo is kind of more cool. Thank you so much. It was pleasure doing. Poetry, it sure should be! And thanks a lot for nominating me. I accept the challenge and will shortly post it on my blog.